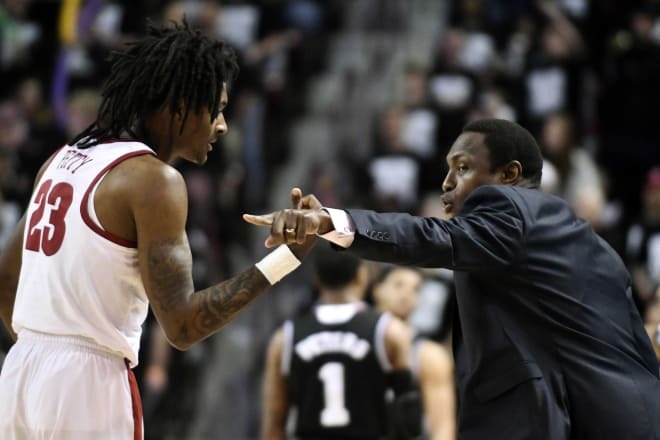 The Alabama men's basketball team will seek their fifth victory against a ranked opponent this season when the Tennessee Volunteers visit Coleman on Saturday. Alabama enters the game at 6-5 in league play, while UT enters with a 8-3 record. Game time is 5 P.M. CT. SEC Network will televise the game. The university has announced that this game is a sellout. Hit the links for game and KenPom stats. My Two Cents: Alabama will have their hands full with this Tennessee team on Saturday. Rick Barnes has done an amazing job developing this team. Even more amazing when you realize that none of these guys were top 100 recruits coming out of high school. It's been player development and chemistry that has led to this season for the Vols. Only a game behind Auburn in the standings, Tennessee is very much in the hunt for an SEC title, Grant Williams is, in my opinion, the frontrunner for SEC Player of the Year, and Rick Barnes is right there with Bruce Pearl for the Coach of the Year honor.This game has been announced as a sellout. Fans in attendance will have to bring their A-game to help lift the Bama players to play their best. Tennessee is currently in the RPI top 10 so a victory for Alabama will be yet another quality win on the resume. Players to Watch: Where have you gone, John Petty, our nation turns its lonely eyes to you. On January 17th, JP scored 27 points in Bama's 76-71 win over Auburn. Since that game, John is averaging 5.1 points per game. Are the struggles part of the dreaded "wall" that freshmen are expected to hit over the course of a long season or just merely the highs and lows that come with a player who relies almost exclusively on the 3-point shot? Whatever it is, this Alabama team hopes that it's temporary, because without John's outside shooting the offense has a tendency to get bogged down. Teams pack it in the paint to limit Donta around the rim as well as disrupt Collin's strength in getting to the basket. I don't think it's a coincidence that in games in which JP scores 10 or more points, Alabama is averaging 76.3 ppg. In games in which he scores in single digits, the team is averaging 69.8 ppg. I think in order to win Saturday, Bama needs John Petty at his best. As of today, I think Grant Williams is the frontrunner for SEC Player of the Year. Yes, this Tennessee team is thriving because of great coaching and team chemistry, but without Grant Williams efforts this isn't a team contending for the league title. Williams is averaging 15.9 ppg, 6.1 rpg, and 2 apg. He's undersized as a 6'7 center, but at 241 lbs he can outmuscle most of his bigger opponents. But he's also skilled, great hands and feet, can make post moves, step out and hit a mid-range jumper. He's a smart player, knowing how to reach the spot on the floor he wants to receive the ball. Good defender. He's a great player, and someone who Alabama is going to have to respect, even with a size advantage inside. However, double-teaming Williams is not always the best recipe for success because he's a willing passer, and this Tennessee team can shoot the ball (39.1% as a team from 3). There are multiple guys who can step up for this Tennessee team, but I think beating them must start with limiting Williams production.